ORIF with bone grafting (Torg JS, JBJS, 1984;66A:209). Electrical Stimulation (see Nonunion) (Holmes GB Jr, Foot Ankle Int 1994;15:552). Bone grafting is generally not needed if intramedullary reaming is done. Semilateral decubitus position (bean bag or large hip bump). All bony prominences well padded. 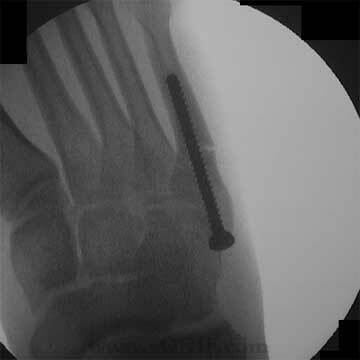 Foot can be placed over the c-arm. Ensure adequate AP, oblique and lateral views of the 5th MT can be obtained. 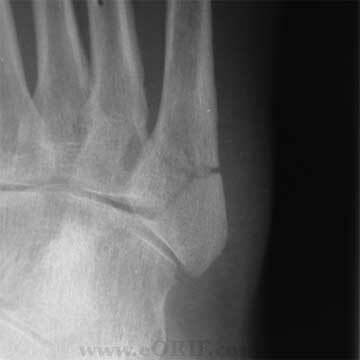 1-3cm lateral incision parallel to the plantar border of the foot beginning at the level of the tuberosity and extending proximal. Take care to avoid the sural nerve. Place intramedullary guide-Entry point is high and inside to the midline on the lateral view. Place wire down the shaft of the 5th metatarsal. Guide wire should extend to the curvatue of the 5th MT shaft. Measure screw length. Usually 40-55mm. Drill proximal cortex and across any sclerotic intramedullary fracture areas with a cannulated drill bit. Place 4.5mm or 6.5mm partially threaded cannulated screw. Countersink the screw head to decrease chance of postoperative painful hardware. May use fully threaded screw is bone proximal to fracture is overdrilled. Needs to have lag screw configuration to allow compression. 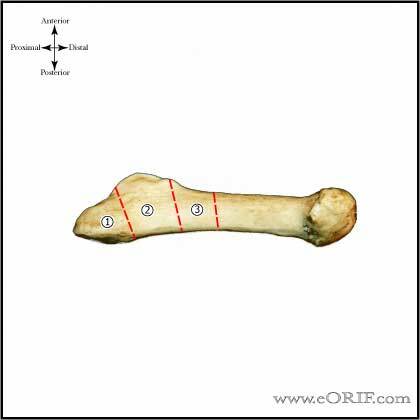 Varify appropriate intramedullary screw placed and fracture reduction with c-arm. 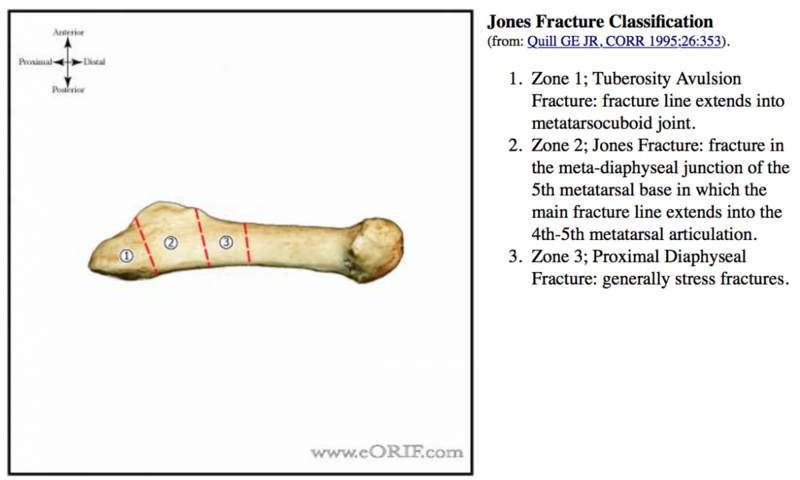 Nonunion: 7-28% for acute true Jones fractures treated with non-weight bearing casts. (Rosenberg GA, JAAOS, 2000;8:332). Post-op: place in bulky dressing with posterior splint, non-weight bearing. 7-10 Days: place in weight-bearing short leg cast. 6 Weeks: xray foot. If callus formation is noted place in cam-walker, WBAT. If no callus formation is noted continue weight-bearing short leg cast. Patients may return to sport when painfree and radiographic evidence of union is seen on xray. Generally 7-8weeks. Gradual return to sport is indicated. Physical therapy, gradual progression to full weight bearing, swimming/elliptical/biking before running. A foot orthosis is recommended for use until athletes complete their competitive careers. Orthosis = extended steel shank or carbon fiber plate (Wright RW, AJSM 2000;28:732). 100% clinical healing. Mean return to sport = 7.5 weeks (Porter DA, AJSM, 2005;33:726). Josefsson PO, Karlsson M, Redlund-Johnell I, et al: Jones fracture: Surgical versus nonsurgical treatment. Clin Orthop 1994;299:252-255. 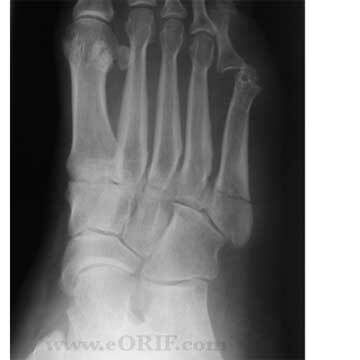 Torg JS, Balduini FC, Zelko RR, et al: Fractures of the base of the fifth metatarsal distal to the tuberosity: Classification and guidelines for nonsurgical and surgical management. J Bone Joint Surg 1984;66A:209-214.